For every dollar spent on research, a further 54 cents are needed to cover the systemic costs. Medical research institutes (MRIs) conduct research in a broad range of health areas, funded by income from a variety of different sources. the systemic costs of research associated with the operations of the institute (indirect research costs – electricity, laboratory equipment, research facilities and services, research governance, administration and support services, etc). 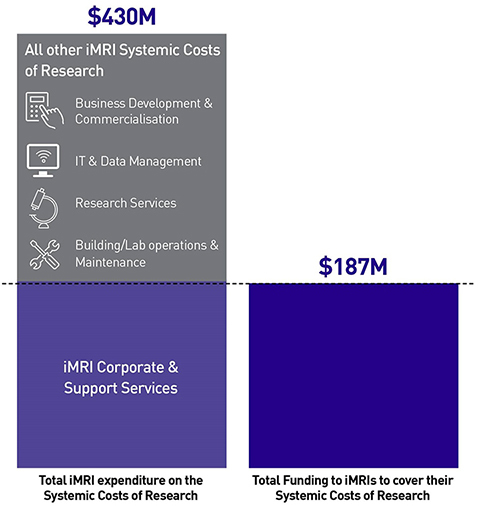 The systemic costs of research (or indirect costs of research) represent a substantial expense incurred by MRIs in providing the support services and facilities necessary to carry out research activities. These costs are normally not covered by research grants, which are only permitted to be used to directly fund research activities. Independent MRIs had to find an extra $247M for the systemic costs of research. Systemic costs include essential research support activities like research services, commercialisation, IT and data management.